The Canadian Finals of Imagine Cup was hosted in Vancouver on Saturday, May 26. The live pitch competition featured a highly competitive field of 6 Canadian Finalists, each delivering an entertaining business pitch and technical demo of their innovative application. Unfortunately, only 3 of the Canadian Finalists could be selected by our panel of expert judges to move on and represent Canada at the Global Finals of Imagine Cup 2018 hosted in Redmond on July 23-25. At the Global Finals of Imagine Cup 2018, 3 teams will represent Canada and compete for a chance to take home up to $100,000 USD in cash prizes, Microsoft Azure grants, and a mentorship session with Satya Nadella, CEO of Microsoft. Hamayal Choudhry is a second year Mechatronics Engineering Student at the University of Ontario Institute of Technology and Samin Khan is a third year Computer Science student at U of T.
Using Microsoft Azure's Computer Vision, Machine Learning and Cloud Storage, they created a robotic hand that uses a camera embedded in the palm to recognize objects and calculate the most appropriate grip for the object. Using Machine Learning, the more the model is used the more it improves. Since all data is stored on the cloud, the trained model stays with you even when you switch devices. 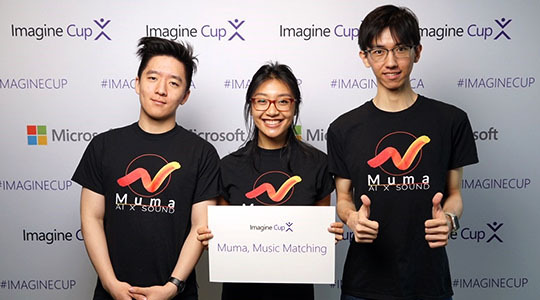 Muma (Created by Irene Lin, Shunzhe Yu, YiMing Han, Gabriel Bussieres and Adamo Carolli during the Department of Computer Science Innovation Lab's business of software course on music and AI, in partnership with SOCAN) is a music matching service that identifies music usage online to capture more revenue for its customers. Muma aims to improve the music industry for music makers and music listeners alike. At the Global Finals of Imagine Cup 2018, hosted in Redmond on July 23-25, 3 teams will represent Canada and compete for a chance to take home up to $100,000 USD in cash prizes, Microsoft Azure grants, and a mentorship session with Satya Nadella, CEO of Microsoft.